Brad Edwards, who teaches trombone at the University of South Carolina, has started up at the Trombone Embouchure Video Project where he is challenging many trombonists to video record their embouchures and post them so that others may make use of them. Here is Brad’s chops. Take a look and see if you can guess his embouchure type. I’ll hide my guess after the break. Long time readers of my blog will know the huge influence my teacher Doug Elliott has had on both my playing and teaching. Doug was the first person I met who understood the role of how anatomical features influence a brass musician’s embouchure. My lessons with Doug inspired me to learn more about brass embouchures and to begin researching that topic seriously. My dissertation, the correlation between Doug Elliott’s embouchure types and selected physical and playing characteristics among trombonists was largely based on a lengthy interview he graciously agreed to give me. The embouchure types I use and much of the other terminology I use were taught to me by Doug. I know other folks who have similar experience studying and teaching brass embouchures, but Doug’s presentation has always been my favorite. Yesterday I was able to catch the first lesson I’ve had with Doug in a few years. It was also particularly exciting for me because I brought a couple of trumpet player friends along with me and got the chance to again watch Doug teach first hand. I’ve had the chance to watch both of these friends play up close many times before and even been asked for advice about their chops in the past, so it was very interesting to compare my thoughts and suggestions to Doug’s. Of course, I found my own lesson to be insightful. Doug has always been able to spot things that I do inefficiently, even though I can make it work for most of my playing. He also clarified some things for me that I had thought I had a good grasp on, but still needed more guidance with. My lesson, however, is probably worth a post of its own later. The topic of the day ended up being players who are “very high placement” embouchure types but who have characteristics of the “medium high placement” embouchure type. Both of my friends who came along for lessons were in this situation and some recent online discussions (including my most recent Guess the Embouchure Type post here) and a private email discussion I’ve been having with John W. dealt with this pattern. This situation has been a tricky one for me to help students with in the past. There have been times where I’ve been able to spot what was going on right away and immediately help, such as one of the trumpet players I documented in Part 2 of my video/blog post on embouchure troubleshooting. In that particular case the trumpet player was playing well with a “very high placement” up to a certain point in his range, but then reversed the direction of his embouchure motion in his high range. Once I helped him keep the direction of his embouchure motion moving up to ascend (instead of pulling down in that range, like a “medium high placement” embouchure player would) his upper register opened up and increased. My friends had some similar experiences in their lesson with Doug. One of them I was already convinced should be a “very high placement” player. Doug helped him tweak his horn angles and embouchure motion and slightly altered the way he set his embouchure formation. My other friend wasn’t so obviously a “very high placement” type player to me, but Doug spotted it right way. What I found most interesting about watching this lesson was my friend’s tendency to bunch his chin while playing. My thought was that in order to determine this friend’s correct embouchure type would be to get him to first stabilize his embouchure formation and then his embouchure type would become apparent. Doug, on the other hand, found his correct embouchure type and the embouchure formation stabilized on its own, without needing to address it at all. My friend’s bunched chin was a symptom, not the cause, of his playing inefficiencies. This situation is a pretty common one and I suspect is the most likely scenario for a player who gets diagnosed with what is sometimes caused “embouchure dystonia” or “embouchure overuse syndrome.” Doug seems to agree with me that the cause of the embouchure dysfunction isn’t usually neurological or overplaying, but rather than a physical playing situation causing some problems that turn into a lack of confidence and setting up a downward spiral. Because most players aren’t familiar enough with how brass embouchures function correctly (and how this can be different from player to player), they aren’t informed enough to find the root cause of their problems. I think Doug was the first person I heard use the analogy that this is like lifting with your back. You can get away with it for a while, and even lift very heavy objects like this when you’re in shape. Over time, however, this can lead to troubles and even injuries. I wonder if this confusion between playing as a “very high placement” embouchure type and “medium high placement” type usually ends up with the player correctly playing as a “very high placement’ embouchure type. If I understand Doug’s point of view correctly here, this is more often the case, rather than players ending up best as a “medium high placement.” embouchure type. This might be because that players who have the anatomy that makes a “very high placement” embouchure type are more common than the other embouchure types. On the other hand, it appears that there’s something about many “very high placement” type players that allows them to play to a high degree with characteristics of the “medium high placement” type, albeit inefficiently compared to how their chops can be working. I know there are some regular commentators here who belong to the “very high placement” embouchure type. If you are (or think you are), have you ever had a period where you struggled due to playing with characteristics that are associated with the “medium high placement” embouchure type? If you know that you’re really a “medium high placement” have you ever been mistyped (by yourself or others) as a “very high placement?” Please leave your comments and thoughts about anything related to this topic below. If you’re looking for help with your embouchure I can’t recommend highly enough Doug’s expertise. You can contact Doug for lesson inquiries through his web site. 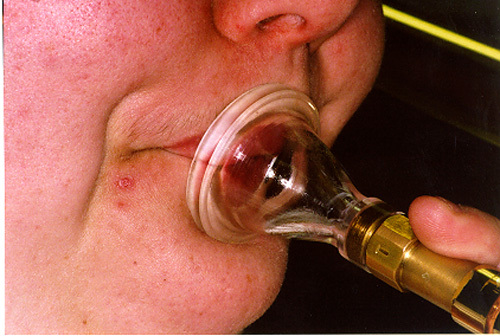 He also makes great customizable low brass mouthpieces, which can learn more about there too. Kelly is a brass doubler who was looking for some help with his or her embouchure type. Hi, i was wondering if there is any way i can tell if im i medium high placement or a very high placement player? I feel i am a flexible player, but i struggle with anything above the staff (Trumpet player) i also play euphonium, but the opposite occurs. Its much easier for my to play in the upper register on euphonium than on Trumpet. does this mean i’m a medium or high placement player? This is a tough question to answer, even when I’m able to watch you play in person. In order to actually give someone targeted advice about embouchure I at least need to see some video footage (here is a post I’ve put together that describes in detail the sort of thing that I like to see on video). There is so much that can happen with a player that causes similar symptoms that any suggestions I offer without watching a player can be the complete opposite of what they should be doing. Even working with a student in person it can be difficult to tell with just one lesson which embouchure type will work best in the long term for a player. Based on what Kelly wrote above I would look at how Kelly’s embouchure looks on both euphonium and trumpet and see if they are indeed the same embouchure type or if Kelly is using a different embouchure type for the different instruments. 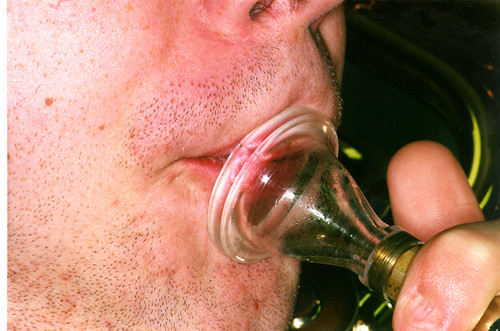 It’s best if a player can play with the same embouchure type for any brass doubles and it will work better if a player places the mouthpieces in concentric circles on the lips, rather than lining up the top of the rim, for example, in the same place. That can result in type switching or even just having to work harder on one of the instruments because the lips may be fighting for predominance inside the mouthpiece cup. It’s not hard to find trumpet players who can pick up a low brass instrument and play very high, but struggle with the low register. If you’re used to focusing your embouchure inside a trumpet mouthpiece you can more easily force the lip vibrations into that very small surface area inside a low brass mouthpiece and play into the trumpet range. On the other hand, usually the tone isn’t so focused sounding and often these trumpet players have difficulty descending this way. 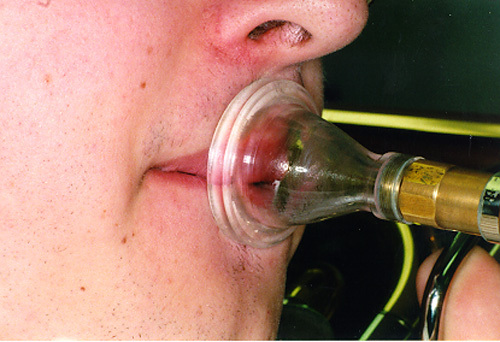 Lip compression needs to start from the mouth corners, not inside the mouthpiece cup. When these trumpet players learn to do this their tone and low register might open up, but they will loose some of their high range until they learn how to ascend from this more appropriate embouchure formation. Another fairly common situation is to find brass players (even non-doublers) who type switch between “very high placement” and “medium high placement” embouchure types. 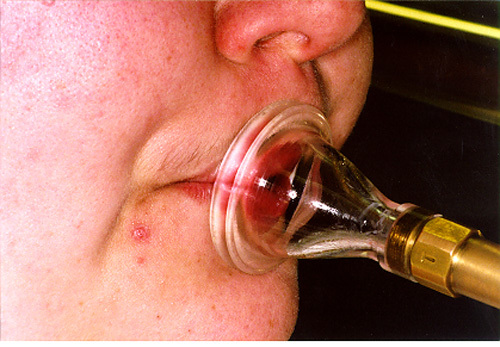 At times it will be clear after a little experimentation which embouchure type is going to be correct, but it can also be very difficult to tell, particularly for players who have not been playing for very long or younger players. 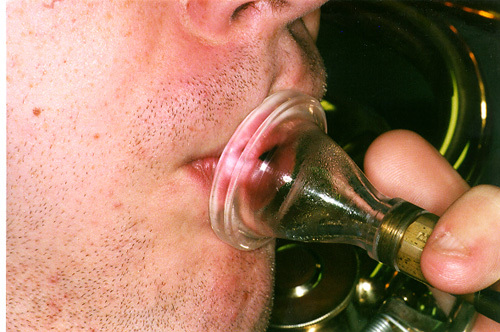 Since your anatomy determines the most efficient embouchure type it is often necessary for the player to allow some time to complete the growth spurt before you can more correctly determine the embouchure type. Players who haven’t yet learned good embouchure form (using the correct muscles, firming the lips correctly, etc.) will sometimes fluctuate between embouchure types as the lack of stability makes it hard to figure out what’s going to work. Without having watched Kelly play, the best advice I can offer for now would be to strengthen up the embouchure formation with some light, simple free buzzing exercises (follow that link for the exercise Donald Reinhardt came up with). I wouldn’t be worrying too much about which embouchure type you have, since if you guess wrong you can end up doing more harm than good. Concentrate on other things (firm your lips before placing the mouthpiece, keep the mouthpiece on the lips while breathing through the mouth corners, practice good breath control, etc.) and over time allow your embouchure type to develop on its own. Most players will naturally and subconsciously figure out their own embouchure type this way. Sometimes a player will type switch and not work out their own embouchure type, however. In this case it can be very helpful to catch lessons from someone who has a deeper understanding of brass embouchure form and function who can do some controlled experimentation and help you find your own embouchure type. At the very least, lessons with an experienced brass teacher who doesn’t really deal with embouchure will help you with other aspects of your playing that should help your embouchure settle down and make your embouchure type more apparent. 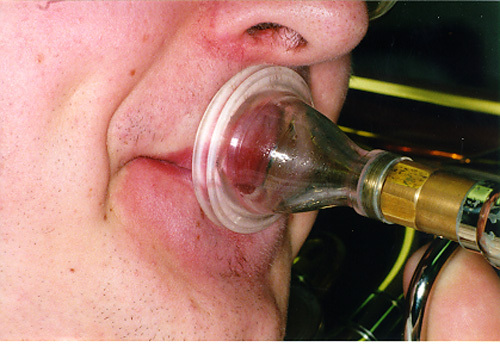 Regular readers may already know that one of my pet peeves is the huge number of brass teachers who (ignorantly, in my opinion) discourage all students from placing their mouthpiece in a way that the rim is contacting the red of the lips. It’s fairly common to hear players talking about the “evils of placing on the red.” I recently came across another example of this by trumpet player Bill Bing. Bing is skeptical that brass players (or at least trumpet players) can play successfully with the mouthpiece placed in such a way that a lot of rim contacts the lower lip. That said, other than a brief mention at the beginning, the rest of this video doesn’t mention placing on the red at all. Nor does he explain why he feel’s it’s a bad thing other than that he’s never noticed it before. The closest thing to explaining why this is wrong is when he comments that he didn’t personally find it successful. My personal experience happens to be the exact opposite of Bing’s. He found it didn’t work to place the mouthpiece on the red of his lips and made a correction that made things better. On the other hand, I found that after being instructed to play with a centered mouthpiece placement moving my setting onto the red of my upper lip actually worked best. It really depends on the individual player and is something that I don’t like to generalize. At any rate, watch Bing’s video (particularly at around 4:51) and take a guess on Bill Bing’s embouchure type. My guess after the break.